Alles MG, Kogan A, Vasarhelyi MA (2008a) Audit Automation for Implementing Continuous Auditing: Principles and Problems http://raw.rutgers.edu/MiklosVasarhelyi/Resume%20Articles/RESEARCH%20%26%20WORKING%20PAPERS/audit%20automation.pdf. Accessed 22.06.2017. Lins S, Schneider S, Sunyaev A (2016b) Trust is Good, Control is Better: Creating Secure Clouds by Continuous Auditing. IEEE Transactions on Cloud Computing (forthcoming). doi: 10.1109/tcc.2016.2522411. National Institutes of Standards and Technology (2002) Federal Information Security Management Act of 2002. http://csrc.nist.gov/drivers/documents/FISMA-final.pdf. Accessed 22.06.2017. 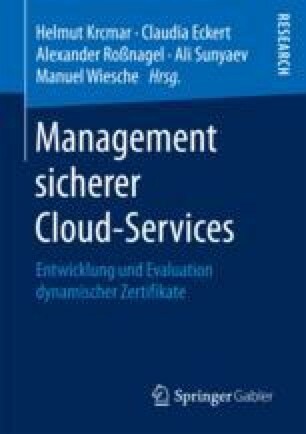 Schneider S, Sunyaev A (2015) Cloud-Service-Zertifizierung. Ein Rahmenwerk und Kriterienkatalog zur Zertifizierung von Cloud-Services. 1 edn. Springer-Verlag, Berlin Heidelberg. doi: 10.1007/978-3-662-47286-6.